Vues de la gamme de 10 miles - 7 min des pistes dans ce chalet de luxe! 4 chambres (2 chambres __gVirt_NP_NNS_NNPS<__ Master) et 4. 5 salles de bains! Chateau Sole 'est un refuge de montagne sophistiquée qui offre une vue imprenable sur les plage de 10 mile et le Jack Nicklaus championnat 27 trous de golf. Situé dans le prestigieux Highlands Parcelle à North Breckenridge idéalement situé à 5 minutes de shopping, ski et le golf. Chateau Sole 'dispose de quatre chambres et quatre salles de bains et un demi avec cheminées 3 de gaz qui complètent la maison à de nombreux égards. Le Château Sole 'possède également un garage chauffé trois voitures qui est attaché à la maison. Il ya 3 écrans plats HDTV dans la maison avec un son surround, ainsi que d'un système audio entièrement intégrée construite dans la maison. Ce sera la maison de vacances que vous aurez envie de revenir année après année. Le niveau principal dispose d'un grand salon avec deux étages de hautes fenêtres en regardant les vues imprenables sur la plage de 10 mile ainsi que le golf de championnat, est attenant à la salle à manger formelle et salon principal avec une cheminée de rock. • Séjour minimum de trois (3) nuits pendant les vacances. • Des dommages importants à la propriété ou les éléments manquants de la propriété peut entraîner une perte de tout ou partie de l'acompte. Les personnes supplémentaires séjournant sans le consentement ou la connaissance des propriétaires peuvent entraîner la perte de la caution. • Il ya un téléphone au Château. Nous vous fournirons le numéro une fois la réservation effectuée afin famille et les amis peuvent vous contacter. • Les services de messagerie et de conciergerie peuvent être organisées pour les pick-up de produits d'épicerie, des vidéos, nettoyage à sec et les produits pharmaceutiques. • pas responsable des accidents. Les locataires sont invités à se méfier de tous les dangers de la vie de montagne, qui peuvent être différents de ce qu'ils sont habitués à. This house worked very well for our group of 8. Clean, nicely furnished and well stocked. Everything in good working order. The private road leading to the driveway (it is a short road) and driveway get plowed eventually but NOT first thing in the morning. So if snow is expected and you want to get out before the plow comes, be sure to have 4WD (or chains). We did have an exceptional amount of snowfall during our stay. It is also slightly uphill all the way out. We would definitely use this house again. thanks for coming out Joel! Your right, record amount of snow while you were there...thanks for coming out and we would be glad to host again! We loved our stay. We had 3 families (total of 6 adults and 6 kids ) and there was plenty of room. No one ever felt in each other's way. Everyone loved the hot tub and kids loved the foosball table. 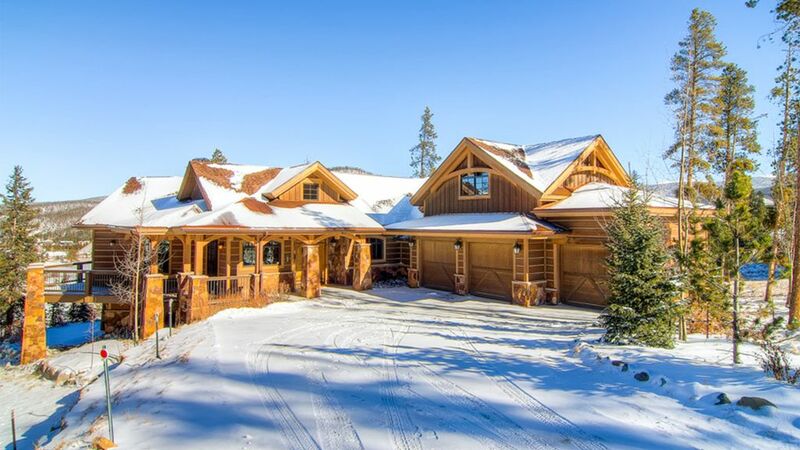 The house has an amazing view and close to multiple ski resorts- Breck, Keystone, Copper. We will stay here again in a heartbeat. Beautiful home suited well for VRBO. Family was disappointed that the spa was broken and that the Foosball table had horrible sag in it. Neither inhibited us from having a wonderful stay and making lasting memories. So beautiful, spacious and comfortable!! This was my family’s dream house! We absolutely loved it and were very sad to leave. It was spacious, well organized and cozy! We are looking forward to coming back to this exact home next year! Thank you for coming out and thanks for the kind words! See you again soon! The property is as the pics look, very well done with nice quality materials. David and his property manager Where always a phone call away and did a fine job at answering our calls. We had 3 families and thought we would have 3 cars in the garage, however unknown to us at the time of rental that one car space is totally used as storage. The next thing was one of the rooms thermostat was non functional and turned out to be a very cold room. One of our sinks was clogged and the drain stop was in the hold water state. When we tried to adjust with the pull nothing happened. Ok no biggie so I looked below and nothing was connected we could just pull the stop out and all was fixed. We all basically had a good night with comfortable furniture and plenty of dishware, except for a tea kettle. The next day we noticed the water pressure was horrible the ladies with long hair had trouble getting soap out. One of our friends just refused to wash her hair until we went to our timeshare where we could use the locker showers. The kids bunk beds where awesome. Plenty for the kids to do and the hot tub was great. My wife called for extra towels and the property manager said someone would be by and no one ever showed with towels our entire stay. We also called to let know our issues so we wouldn't get in trouble for them as when we meet the cleaners they said the last bunch left the place the worst they have seen in a very long time. So we thought maybe it was them who messed or broke these things. The other issue with the shower was in the master bath advertises a steam shower. Guess what it doesn't work. We went to cook steaks and holly crap I have stayed in many places and have never seen a grill so full of cakes on grease. After cleaning the best we could in the time we had as to not take time away from our dinner. Bad move as the grease on the underneath of the grill crates just caught on fire and did a job on our wreaked as the flames where on the meat. As we where cleaning up from dinner we tried the dishwasher and it would turn on for a min or two and shut off. Hmmm. I grew up in construction my dad who owes his own business in construction was there as well. We checked out the dishwasher and pulled out all kinds of glass beer can tabs and twist ties etc from the drain in the dishwasher. I took pictures that I later showed the representative from the property management. out of space to continue. We loved this home and couldn't have asked for anything better.